I worked for 4 years after getting my B.S. in many different ecological settings. I worked with East Bay Municipal Utility District on their mitigation projects on the Mokelumne River in the Central Valley of California doing Chinook Salmon habitat restoration and collecting population data such as redd counts, carcass surveys, and counting adults passing through the fish ladder of Woodbridge Dam. On Suisun Marsh I worked for California Waterfowl Association collecting data on nesting waterfowl by performing nest surveys, tagging and banding hens and ducklings. 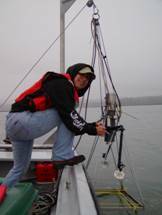 I also worked for USGS monitoring wetland plant and bird populations on sites of wetland restoration and salt pond restoration in San Pablo Bay. Much of the work performed for USGS included bird and plant surveys but the fun part was tagging surf scooters with radio and satellite telemetry and tracking them around to look at migration patterns. I also worked for a consulting firm on a number of projects that included fish and bird habitat within the Sierra Nevada. I consider myself as a biologist who is a generalist. It’s always been hard for me to focus on one thing because all ecosystems and the critters that live with them are interesting to me but in general I see the importance of maintaining and restoring habitat and want to be involved gaining a better understanding on how critters and habitats interact. I came into Moss Landing Marine Laboratories on an assistantship from NOAA that was geared toward getting students involved in habitat mapping. I didn’t have a background in marine science but the opportunity was huge and the possibilities of where this could take me were exciting. Growing up I wasn’t a sit on the couch type of kid. My father always took us fishing and that brought along my appreciation for the outdoors. Also, I grew up close to a man made lake where my brothers and I would spend our summers. We would say we were going “just fishing” but we would catch crayfish, chase down lizards, gopher snakes and bugs and even pick cactus fruit to eat despite always ending up with prickly things in our tongues. The cool thing is that after a day of play we were proud to bring home fish, crayfish or cactus that my mom could actually cook up for us. Ironically, my father was terrified of the ocean and we were pretty much forbidden to visit it but luckily my mother loves the ocean and whenever my father was overseas (he was in the marines) she’d take us there (thanks mommy) :). Anyhow, I think just being able to go out and interact with the outdoors and the critters always made me feel happy and that’s what has shaped my desire to be a biologist. As far as opportunities, unfortunately, I actually wasn’t raised in a household where education was encouraged too much so I had to find my own way. My high school grades where awful and on top of that I had a daughter before I graduated but luckily community college was an avenue that was available to get me going in the right direction. I took advantage of every program offered to me and I met lots of great people that worked at my community college who cheered me on and gave me so much support. I feel as if before community college I never knew education and the taste of knowledge. Once I began learning, the possibilities seemed endless and that propelled me to keep going. When I got to UC Davis I took advantage of whatever internship I could find and towards the end worked for Department of Fish and Game to get as much experience as possible. The best way to get ahead in this field is to get as much experience as possible, as soon as possible. I am studying the erosion in the Elkhorn Slough and how it is affecting the distribution of subtidal habitats. This is a topic that is important to me because it is in my backyard. Estuaries have suffered all over the world despite the fact that they are extremely important as a type of sanctuary for many marine mammals, birds and fish. After the construction of the Highway 1 bridge in 1948, Elkhorn Slough has undergone drastic changes. Prior to the bridge, some locations that are now up to 30 feet deep, were so shallow that you could walk across and were filled with seagrass. In a 60 year period this amount of change is phenomenal and is mind blowing to me. It is evident that intertidally the mashes are eroding and being replaced by barren mudflats but I am interested in what is happening subtidally. The loss of seagrass in some areas has given way to areas of clay, shell and macroalgae that are more typical of a kelp forest. I think it is important to look at what habitats are formed by this erosion and, at the very least, to document what is currently there so we have an idea of what types of habitats are potentially lost or gained by this changing system. I am hoping to get a job were my knowledge can be used in the restoration and monitoring of critical habitats. I would love if I could have a career that would allow me to use science to make wise decisions about how we care for our environment. For my family the most rewarding thing is that I am the first to graduate from college and then to go on further and finish graduate school is the icing on the cake. To be able to set a positive example to my little sister, daughters, cousins, mother, and community is extremely rewarding. A personal reward that education has given me is the ability to experience a different world. To be able to see the world through glasses that are magnified by knowledge. To know about things you didn’t know before is liberating. Education in general, in any field can do that. The challenging aspect about grad school is that it’s not like undergrad where you just take classes with exams, but instead, the challenge is coming up with questions and then figuring out how you are going to answer those questions, and this is difficult. Also, since you’re not taking classes you are liable for keeping yourself on track. Although this process is difficult, when you see your progress it is something to be proud of.